Specialty CME Credits:: Included as part of the 4 credits, this CME activity is eligible for 1 Pharmacology CME credit, subject to your state and institutional approval. 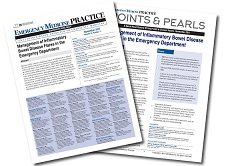 Because of the chronic relapsing nature of inflammatory bowel disease (IBD), emergency clinicians frequently manage patients with acute flares and complications. IBD patients present with an often-broad range of nonspecific signs and symptoms, and it is essential to differentiate a mild flare from a life-threatening intra-abdominal process. Recognizing extraintestinal manifestations and the presence of infection are critical. 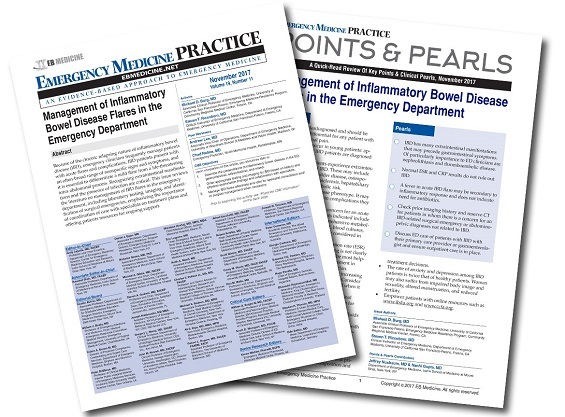 This issue reviews the literature on management of IBD flares in the emergency department, including laboratory testing, imaging, and identification of surgical emergencies, emphasizing the importance of coordination of care with specialists on treatment plans and offering patients resources for ongoing support. This article was very well written. Confirmed much of my practice but also refreshed some knowledge that was buried very deep! Important topic--very relevant and often not thought of by many. I am now better able to recognize IBD vs other acute abdominal pathologies. And I have a better understanding of the varied complications and presentations of disease in patients with underlying IBD.